The Kattaiparichchan bridge, which divides the Liberation Tigers-held villages in Muttur east from the rest of Muttur town controlled by the Sri Lanka Army, is on the verge of collapse, said Tamil National Alliance parliamentarian from Trincomalee, Mr.K.Thurairetnasingham, and brought the matter to the notice of the Trincomalee District Co-ordinating Committee Monday, sources said. On the other side of the bridge, a detachment of the Sri Lanka Army is located. People who go to villages in the LTTE-held Muttur east are first checked at the SLA sentry at the boundary of the Kattaiparichchan village. 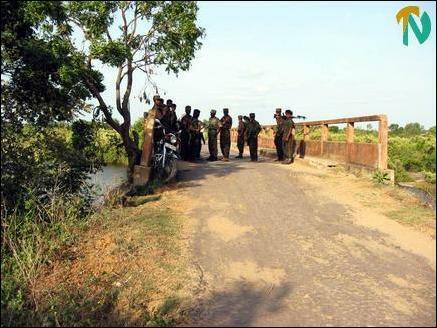 Thereafter they are allowed to proceed to LTTE-held villages through the bridge, divisional sources said. Mr.Thurairetasingham, the solitary national list parliamentarian of the TNA, who hails from Muttur east, said that the Kattaiparichchan bridge was constructed in 1971 due to the untiring efforts of the then Muttur parliamentarian, the late Mr.A.L.Abdul Majeed. “The bridge may collapse in coming months if the authorities concerned fail to take immediate steps to repair it. I have brought this matter to the notice of the authorities concerned but no prompt action was taken," he said. The Kattaiparichchan bridge which divides LTTE and SLA held areas in Muttur division. LTTE cadres are seen on the bridge. Mr.Thurairetasingham further said the bridge links about thirty Tamil villages in the LTTE-controlled Muttur east with the Muttur mainland controlled by the army. The road that links the villages with the mainland and leads to Kattaiparichchan via Pallikudiruppu and Thoppur, is also in a deplorable condition. The road transport between the LTTE-held Tamil villages in the Muttur east would be severed if the bridge were to collapse. Urgent action should be taken by the authorities concerned to prevent the bridge from collapsing, the TNA MP stressed at the DCC meeting, district secretariat sources said. ”Muttur east villages have been ignored in the sphere of development for the last several years. The Eastern Regional Development Ministry has allocated money for the development of villages in the district, but people are not satisfied with the way the funds are allocated by the ministry,” said Mr.Thurairetasingham. The construction of bridge over the Killiveddy river has not been completed. People find it very difficult to travel or take their goods to Muttur through the river by ferry. The Eastern Regional Development Ministry has not taken any steps to expedite the construction of the bridge. All communities are using the Killiveddy ferry, Mr.Thurairatnasingham pointed out.